It’s that time again … time to begin this year’s One Book One Community (OBOC) celebration of The Hound of the Baskervilles by Sir Arthur Conan Doyle! Everyone in the whole family is invited to join us for a fun, FREE street party at the Main Library at Goodwood from 6 until 8 p.m. Saturday, February 23. 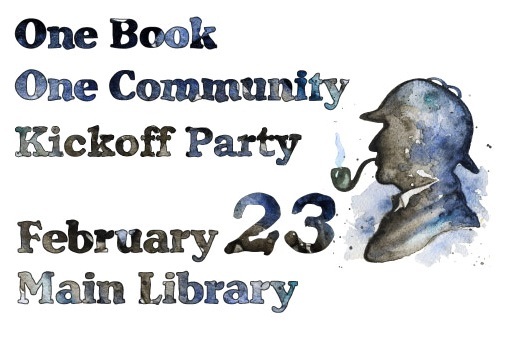 You won’t want to miss this family friendly event that’ll formally kick off the spring reading program with activities including FREE food, games and prizes, crafts, face painting, an old-fashioned Cake Walk to win a delicious confection, live music by the Wael and Anna band, plus a visit from Sherlock Holmes and much more! In addition, events will be planned throughout the spring through May with book clubs, community groups, discussions on addiction and substance abuse, film screenings and more related to the book and its author. 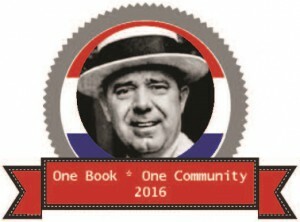 For more information about this year’s OBOC season, the book and a full schedule of events and programs, visit www.ReadOneBook.org. 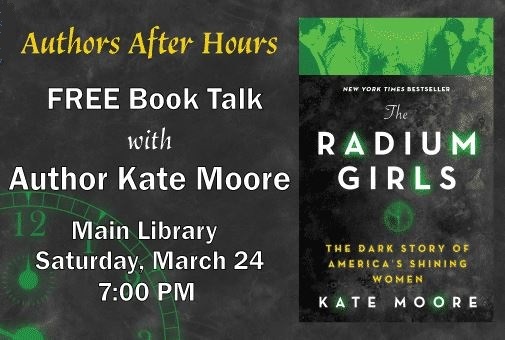 The Dark Story of America’s Shining Women with author Kate Moore. In the book, Moore traces the lives of more than a dozen American women who were employed as luminous watch-dial painters as early as 1917. She tells how these women, some barely in their 20s, were enchanted by high pay and the allure of the paint’s luminescent substance: radium. Carefully researched, the work will stun readers with its descriptions of the glittering artisans who, oblivious to health dangers, twirled camel-hair brushes to fine points using their mouths, a technique called lip-pointing. By the end of 1918, one out of six American soldiers owned a luminous watch, but the women who made them that way didn’t experience such glowing results. Copies of the book will be sold at the event. Stick around after the discussion to have your book signed by the author! 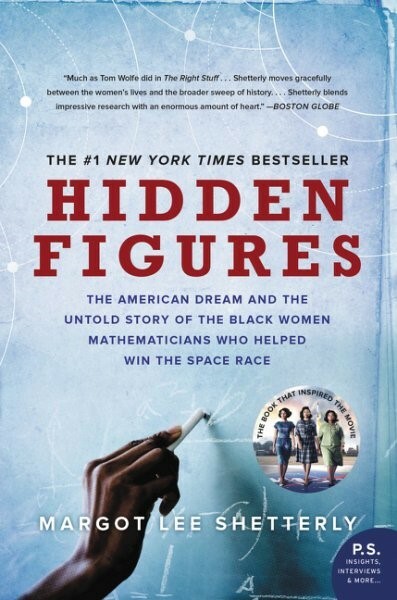 Blast off with us at the One Book One Community launch party celebrating Hidden Figures by Margot Lee Shetterly at the Main Library at 6 p.m. Saturday, February 24! 2018’s title was first announced at the annual Louisiana Book Festival downtown in October 2017. There’ll be free food, music, games, prizes, stargazing and even a “Moon Walk” cake walk! Our special guests include Dr. Tamiara Wade, former Learning Expert at the NASA Stennis Space Center; and Alyssa Carson, a 16-year-old aspiring astronaut who attended Space Camp seven times, Space Academy three times, Robotics Academy once, and is the youngest-ever graduate of the Advanced Space Academy! Learn more about Carson at www.nasablueberry.com. Partners Forum 35 also will be on hand to welcome the NASA STEM Team! Lots of other events, programs, movie nights, book talks, crafts and more related to the book and OBOC will be scheduled throughout the community all spring long. All the events are FREE. A schedule and related information, as well as an InfoGuide, is posted at www.ReadOneBook.org, and it will be updated periodically with additional events. LASM Discovery Dome Presents Magic Tree House: Space Mission & We Are Stars – Discovery Dome presentations run March 5 – 28; For a full schedule, pick up a copy of the Library’s monthly newsletter The Source, or visit the online calendar at www.ebrpl.com. For more information about the FREE One Book One Community launch party, call (225) 231-3750. To learn about any of the Library’s other free programs, events or resources, visit us online. Good morning, campers. If the daily grind is getting you down, please come with us on a variety of magical journeys. 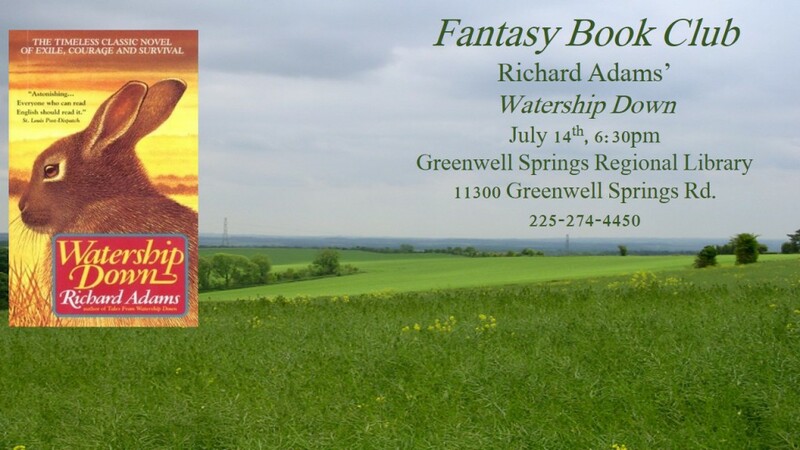 We’re speaking, of course, of the nearly-brand-new Fantasy Book Club at the Greenwell Springs Branch. You can find Watership Down all over the place, like in our online catalog. It’s a great book. We have it on good authority that if you read it and then go to book club, there will be snacks. Enjoy! Join us at the Main Library for an old-timey festival to kick off One Book, One Community 2016! 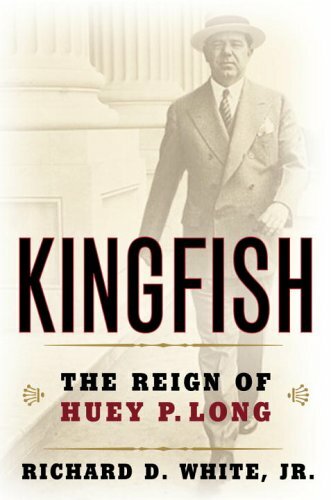 If you’ve been carefully avoiding library resources because your reading list has gotten ridiculous and you just can’t add another book to it (…not that we can relate), you may not know that this year’s book is Kingfish by local historian and dean of the E.J. Ourso College of Business, Dr. Richard D. White, Jr. 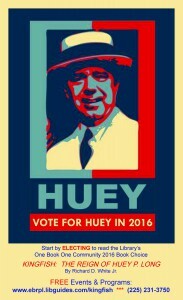 The book is a biography of notorious Louisiana governor Huey P. Long. It begins with his beginning, and ends with a thoughtful analysis of the long-lasting effects of his political machinations. The middle is full of all kinds of scandals. So you should read it anyway! Everything else you’ve got checked out can totally be renewed until later! But first you should come to the party, this Saturday, February 20th at 6:30 PM on the plaza at the Main Library, on Goodwood! We’ll have all kinds of food, music, games, and activities, including a sing-along of the LSU fight song “Every Man a King” (which Governor Long helped write); soap-box debaters; mock voting; and at least one of our dear librarians will be dressed up in a seersucker suit! Raising Cane’s, Taylor Made Concessions, and Bertrand Bailey’s Down Home Country Cooking will all be providing free concessions! There will be performances by the Greater Baton Rouge Barbershop Quartet and the Michael Foster Project! There will be free face painters, caricaturists, and a cakewalk, to name just a few of the entertainment options. You can even win something, like a party pack from Raising Cane’s! With this much going on, I mean, we’re not saying we’ll think badly of you if you don’t come, but we WILL be very sad. For you. For missing out. So when you think better of it and show up, don’t forget to use the hashtag #readEBR on Twitter and Instagram to let us know what a fabulous time you’re having! 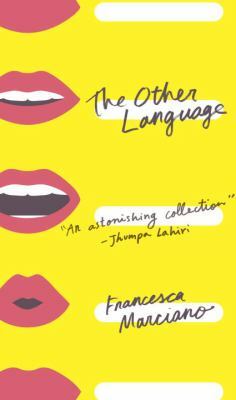 Italian author and screenwriter Francesca Marciano presents a stunning collection of short stories with her latest work, The Other Language. All of the nine stories feature Italian characters and share common themes of wanderlust and change. Marciano’s protagonists come from all walks of life and are scattered across the globe — from New York to Kenya to Rome — but each protagonist is yearning for something (or someone) else but not in an off-putting way. Highlights are “Chanel,” about a filmmaker who buys a Chanel haute couture gown for the David Awards (the Italian equivalent of the Academy Awards) and, through a series of setbacks, ends up never wearing it, and “The Presence of Men,” in which an old seamstress in a remote Italian village receives the commission of her life when a Hollywood actor hires her to make him a bespoke wardrobe. I usually don’t go for short stories, but this collection is a gem. It takes talent to create a fully developed atmosphere and characters the reader will care about in some way in just a handful of pages. Marciano has it in spades. Brava. *This review was first published in The Advocate (Baton Rouge, La.) on Sunday, August 9, 2015. Harper Lee published her second novel Go Set a Watchman this summer, a follow-up to the Pulitzer Prize-winning To Kill a Mockingbird. 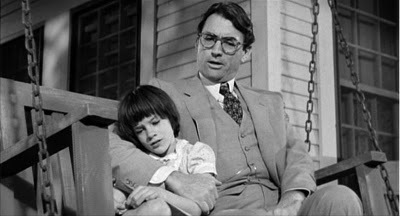 To celebrate this beloved Southern author, we are hosting an exciting event this coming Monday, August 3, at the Main Library at Goodwood: we will read To Kill a Mockingbird aloud from start to finish! The all-day readathon will feature librarians and special guests from the community. This is a great opportunity for students to experience this iconic American classic in a unique way right before school starts or for adults to discover or revisit this important read. Join us anytime on this Monday the 3rd starting at 8:30 a.m. and follow #MockingbirdMonday and #ebrpl on social media. Mark your calendars for a book discussion of the much-anticipated Go Set a Watchman on Tuesday, September 15, at 7 p.m., also at Main. We have lots of copies of the book in a variety of formats at the library and we can’t wait to hear what you think of it at the book discussion! Harry Potter is turning 35?! 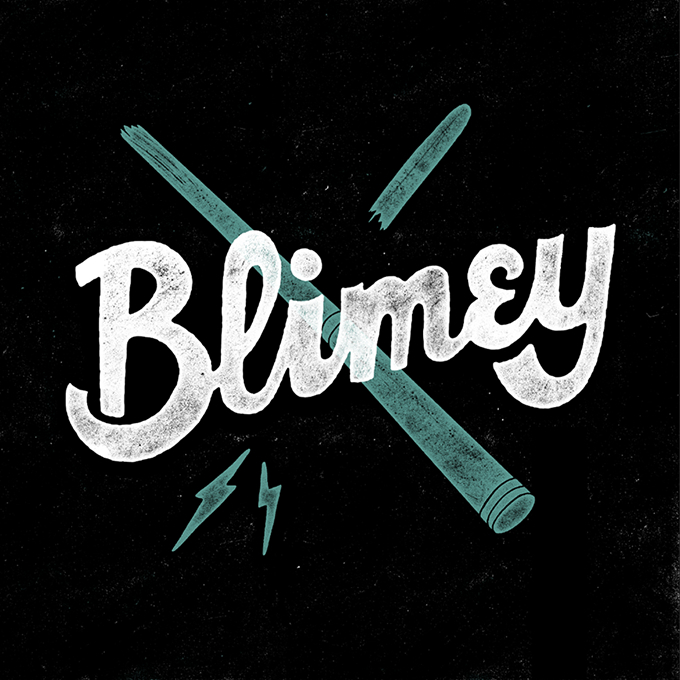 Blimey is right! 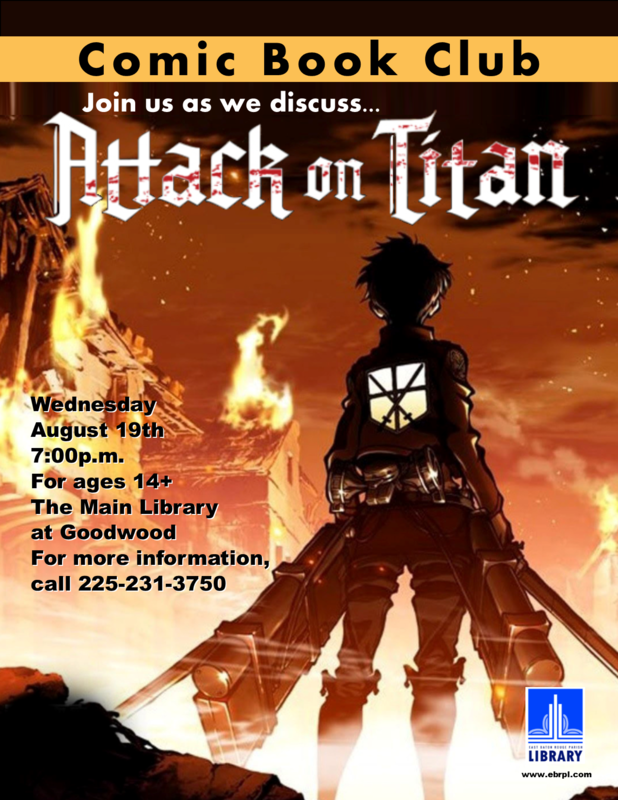 Join us this Thursday, July 30, at 7 p.m. at the Main Library at Goodwood to celebrate the Boy Who Lived’s birthday a day early. We’re having a costume contest and trivia contest with prizes. Muggles of all ages are welcome!